Carson City, the 6th most populous city in Nevada, sits at the foot of the Sierra Nevada 28 miles south of Reno, surrounded by hills in most directions. Those to the northeast harbor dozens of old mines, and the historic settlement of Virginia City, but most visitors in town head west, along US 50 to the shore of Lake Tahoe, one nearby attraction being Lake Tahoe Nevada State Park. To the north, I-580 from Reno passes the much smaller Washoe Lake, popular for fishing, boating and camping. Carson City has several golf courses, one beside the Carson River which flows past to the east. The new interstate freeway bypasses the city center; instead the main road is US 395, Carson Street, which is lined by many shops, hotels, restaurants and casinos, stretching for five miles. The recently built Courtyard by Marriott hotel in Carson City sits along Carson Street, on the south side of town at the center of an area of shops, restaurants & a movie theater, and right next door to Casino Fandango. Undeveloped countryside starts a little further south, and the east shore of Lake Tahoe is an easy 13 mile drive away. The 100 rooms & suites feature plasma TVs, luxurious bedding, a refrigerator, executive desk, sofa bed, and mountain views - some have a private balcony. The Bistro restaurant serves freshly cooked breakfast each morning and dinner in the evening, while drinks are available from the elegant Lobby Lounge. Also available are a pool/hot tub, fitness center, guest laundry, business center and a meeting room. Hilton are represented in Carson City by the 85 room Hampton Inn - the northernmost hotel in town, built in a lightly developed area near the Carson Street/I-580 intersection. West-facing rooms have uninterrupted views towards the Sierra Nevada. 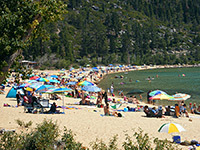 The nearest restaurants are half a mile south, while Carson Tahoe Regional Medical Center lies just across the street. Accommodations include a selection of one bedroom suites and studio suites, with extra living space and a sofa bed. Hot breakfast is complimentary (take-out version available), as is wi-fi. A business center and meeting room are provide for guests here to work. Holiday Inn Express Carson City is situated towards the northwest edge of town along US 395, close to Carson Tahoe Regional Medical Center and the Silver Oak Golf Club, although the immediate surroundings are open grassland. The new, 3 floor hotel has a good reputation for its friendly service, clean accommodation and the free hot breakfast buffet; its other main amenities are a fitness center, indoor pool & whirlpool, guest laundry, a meeting room, and a microwave & refrigerator in each of the 88 rooms. The larger suites have additional facilities of divided sleeping/living areas, sofa bed and a wet bar. Several restaurants and large stores are located just to the south. On the main road through Carson City, Quality Inn Trailside Inn has a typical motel layout with its 67 refrigerator-equipped rooms arranged in three exterior corridor blocks enclosing the parking lot, at the front of which is a smallish outdoor pool. The neighborhood is generally quiet, the staff welcoming, and the rates are low, yet the inn still offers all the basic facilities, of free continental breakfast, free internet access, guest laundry, and a copy/fax service. All major locations in Carson City are within 3 miles. Basic, exterior corridor lodging is provided by Days Inn Carson City, an affordable, pet friendly motel with a good location along Carson Street, a short walk from shops, restaurants, bars and casinos, towards the north side of town. Selected accommodations feature a microwave and refrigerator. Free continental breakfast is provided; the only other amenities are free wi-fi and a copy/fax service. Like most properties of this affordable brand, Motel 6 Carson City caters for guests in a two floor building with outside corridors; rooms are divided between several interconnected blocks, surrounded by plenty of parking space. An outdoor pool is located at the front, partly shielded from the main road by trees. There is one restaurant adjacent and others close by, mostly to the south. The nearest casino (Fandango) is 0.8 miles south. The motel offers free wi-fi, free coffee and a coin-operated laundry facility. The budget-priced Super 8 Carson City occupies a compact, interior corridor building of two floors and 63 refrigerator/microwave-equipped rooms, which have views across a typical suburban neighborhood of shops, restaurants and other businesses; along the main road through town (Carson Street). The nearest large stores are half a mile south, including Kohl's, JC Penney and Raley's Supermarket. There is no pool or fitness center; the only amenities are free continental breakfast and free wi-fi.